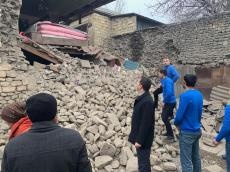 Representatives and volunteers of the Regional Development Public Association of the Heydar Aliyev Foundation met with residents of Azerbaijan's regions affected by the earthquake, Trend reports referring to the Heydar Aliyev Foundation on Feb. 6. According to the instructions of President of the Heydar Aliyev Foundation Mehriban Aliyeva, representatives of the public association, who visited the houses of all residents, collect information about the problems that have arisen as a result of the earthquake and work together with the corresponding executive structures to solve them. The problems of all the inhabitants were rapidly solved.